After Helsingholmen we had been hoping to visit Stenskar. But its harbour isn’t well-protected from the fairly strong southwest winds, so after a phone discussion with Anna & Raiku we decided to meet up again in Gullkrona. We last year spent two days in Gullkrona – it’s a very beautiful island, but perhaps a little too effectively courting the tourists. The trip from Helsingholmen to Gullkrona is short, but the winds were so strong that we ended up beating to windward with just our storm jib. Not many boats would go so well to windward with only a jib set, but even Kittiwake could not sail very close to the wind, and we spent several hours tacking to and fro. Luckily Anna & Raiku (whose larger yacht Noppa had no trouble with the strong winds) had saved us a good place at a jetty in Gullkrona. Gullkrona’s harbour was safe but a bit windy, but as we found last year if you take the ‘troll walk’ across the island, there’s a lovely sheltered beach for sunbathing and reading. As the winds were still strong the next day, we decided to again stay a second day in Gullkrona. From Kejsarhamn we went on to Helsingholmen for lunch, but it was so peaceful and sunny there we decided to stay. Helsingholmen is a small island with a one-family harbour, originally just fishing but nowadays doing well from the visiting yachts. Helsingholmen is particularly interesting to me as it’s one of the westmost parts of the Salpausselkä terminal moraine ridge, which marks a point where the edge of the Ice Age ice sheet paused and deposited lots of stones. The ridge runs right from here in southwest Finland to eastern Finland, and its dam forms the southern boundary of the Finnish central lake district. 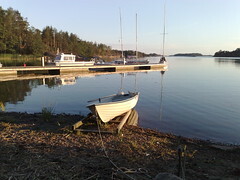 From Rosala, Anna & Raiku suggested we meet up at Kejsarhamn, a small harbour at the north end of Högsåra named for the Russian Czar’s visits there in his sailing yacht in the late 1800s. The harbour is fine but simple, but the real reason to go to Högsåra was to visit Farmors Café, a lovely café in the main village of Högsåra. The café is in an old wooden house with lots of tables in the garden, and the big attraction at least to Anna’s nephew was that when you choose your cake, you get to cut your own slice as large as you like. As we sailed west from Hanko the wind slowly picked up. We reefed the mainsail and put on the storm jib, and after a while even took down the storm jib and continued with just the reefed mansail. Despite this we were making very good time with the wind behind us, even overtaking a larger boat that had its full sails up. At one point we touched 8 knots, though it was mostly 6-7 knots. As the end of the afternoon approached we had to decide on our destination harbour. 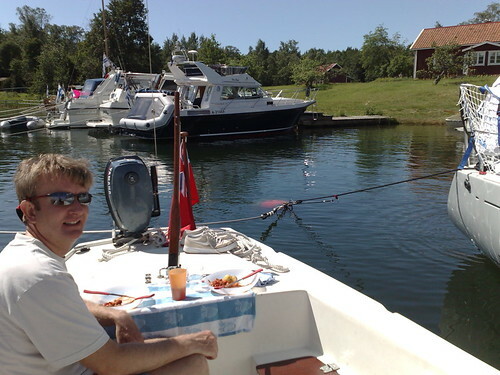 We’d gone to Kasnäs at this point last year – it’s a full-service harbour but rather boring. Anna & Raiku had gone on to nearby Rosala, so we called them up and asked if there was room there for us, They said there was, so off we went. Rosala was a very nice small harbour, which we’ll surely visit again. There was a small shop and café, and the meals in the café were simple but just what you want when you’re sailing. 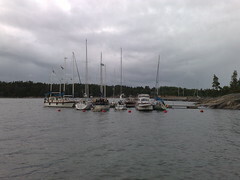 After Jussarö we sailed on to Hanko, taking the more direct seaward route. The first part of the trip was easy and fast, but as usual Hanko’s church and water tower came into view from a very long way off, and over the course of a couple of hours didn’t seem to get much closer. Eventually Eve insisted we switch to the engine, and we motored on in. We stayed at Hanko’s Itämeren Portti harbour, which is built on a rocky island at the mouth of the harbour. It’s very comfortable and convenient, but at 30€ per night it’s rather expensive. After a meal at a restaurant we had a beer with a colleague of Eve’s, Marja and her husband (who in fact we’d also bumped into a day earlier at Café Barösund on the way to Jussarö). 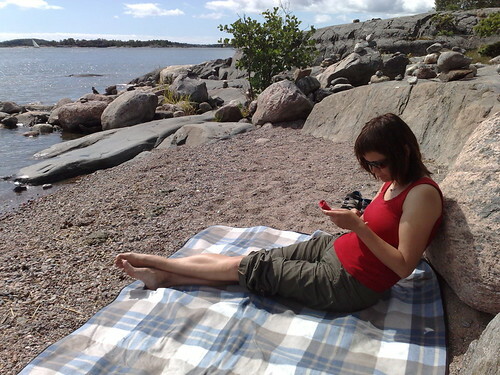 The following day we decided to stay in Hanko and get some washing and shopping done. That evening we met another colleague of Eve’s, Anna, who had sailed there with her husband Raiku, nephew and father-in-law. Today started with rain in Inkoo, and the first hour or two we just motored along in the rain. But it had already cleared up by the time we stopped for lunch at Cafe Barosund, and through the afternoon we glided along in a sunny light breeze. Towards the end of our day’s sailing the wind strengthened considerably, and we reefed the mainsail just in time. The last half an hour or so was a painful slog upwind, leaning over at 45 degrees and pounding through the waves. Finally we reached our destination: Jussarö, one of the outlying islands of the Tammisaari national park. The harbour is fairly sheltered, and there’s a cafe / souvenir shop (where I’m writing this now over a beer). Soon I’m off to bed – tomorrow we’ll explore the island, them we’re off to the picturesque port town of Hanko. Barbequeing with Helena & Tom yesterday evening was fun. Now we’re back at Inkoo harbour, sitting in the cafe looking out at the rain and not exactly looking forward to today’s sailing. We were planning to go to Elisaari, but there’s nothing to do there in the rain, not even a dry cafe to sit in, so probably we’ll go straight on to Tammisaari – a long day of motoring in the rain. Luckily we’ve got good sailing waterproofs, though it’s really difficult to dry them off in such a small boat. Yesterday we sailed Kittiwake to Inkoo and picked up Mari & Georg, who are spending the weekend with us at the cottage on Vormö. Today we did a bit of rowing and then sheltered in the cottage while some thunderstorms passed by. 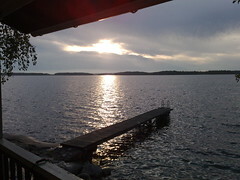 Now we’re at the sauna – we’re finished with the bathing and just chilling out and watching the sun go down. 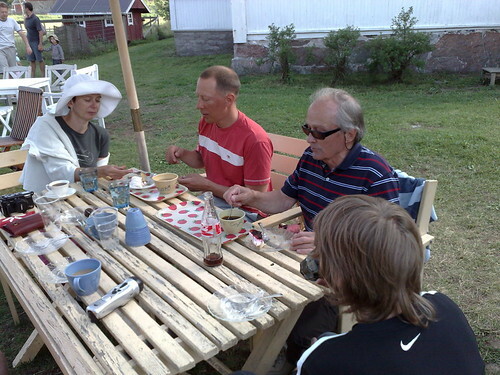 Tomorrow we clean the cottage and then take Mari & Georg back to Inkoo. We’ll leave the boat there overnight, as we’re off to Helena & Tom’s for an evening of barbequeing. On Monday we’ll return to the boat and probably sail on to Elisaari. Yesterday we borrowed one of the rowing boats and went for a short trip that turned into a longer one. We set off round the south coast of Vormö, which is all shallow bays and islets, very picturesque and sheltered. The terns warned us off when we went too close to their nests, and a swan guarded its bit of shoreline. Eve asked me to find a place to go ashore – as you can see, I found a gap in the rocks that fit our rowing boat perfectly. After a while, I proposed that we continue on and do a lap of the island – when you’re on an island, it’s a shame not to row all the way round it, and we’d already made a good start. At the east end of the island we found a swimming beach, but the water was too full of algae, which is a problem all around here. Rowing back along the north side of the island was much less fun (especially with a bit of a headwind), but after a long hard row we got back to the Nokia harbour. And only one tiny blister – I was expecting much worse. Perhaps the sailing is toughening up my hands. Today we had the first afternoon sauna turn, and hence the responsibility of lighting the fires, so we’ve just hung about near the cottage, read books and dozed. I’m not sure what we’ll do tomorrow – let’s see how active we feel. We’d like to visit Inkoo, but that will probably be later in the week. Our four-week summer holiday has begun, and today we sailed from Helsinki to Vormö, 7 hours of fast sailing through the coastal archipelago with a good tailwind. At Vormö Nokia has twenty summer cottages which employees can rent cheaply – very basic cottages with electricity but no running water, but Finns like them that way. 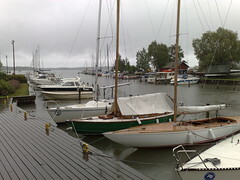 The photo shows Kittiwake (leftmost sailing boat) moored at the Vormö jetty. We’ll spend the next week based here at our cottage, barbequeing, saunaing, going for short day cruises, and just generally lazing about. 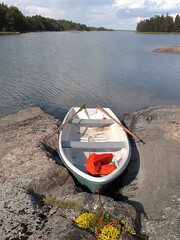 Then, weather permitting, we’re off for two or three weeks cruising the Turku archipelago.